"How Far Can New York Climb into the Sky?" World, January 20, 1907; Art by Louis Biedermann. Joseph Pulitzer's business world was a newspaper in three parts: the World, the morning edition published Monday through Saturday; the Evening World, the later edition that highlighted sports results; and "The Great Sunday World," which was a hefty weekly brimming with feature articles and vivid color illustrations. The three Worlds boasted a readership that eclipsed all rivals; at times, the Sunday World sold half a million or more copies across the country. Typical of the publication's sensational prose, the World in 1899 made a front page declaration that it had achieved the "largest circulation ever reached in one year by any newspaper." The World's eye-catching imagery included cartoons, caricatures, fashion drawings, futurism, and more, attracting readers with its brilliant colors and a wide range of artists. The quality was made possible by recent technological advances in color printing. In 1898, Pulitzer purchased a high-speed, color printing press from R. Hoe & Company. The newspaper proclaimed that press "the most Marvellous Mechanical Production of the Age," capable of printing, pasting, and folding the paper's color supplements at a rate of up to twenty-thousand copies an hour. While color printing had begun five years earlier in the newspaper industry, the adoption of the World's new color press allowed the World to be produced and disseminated at unprecedented speed. 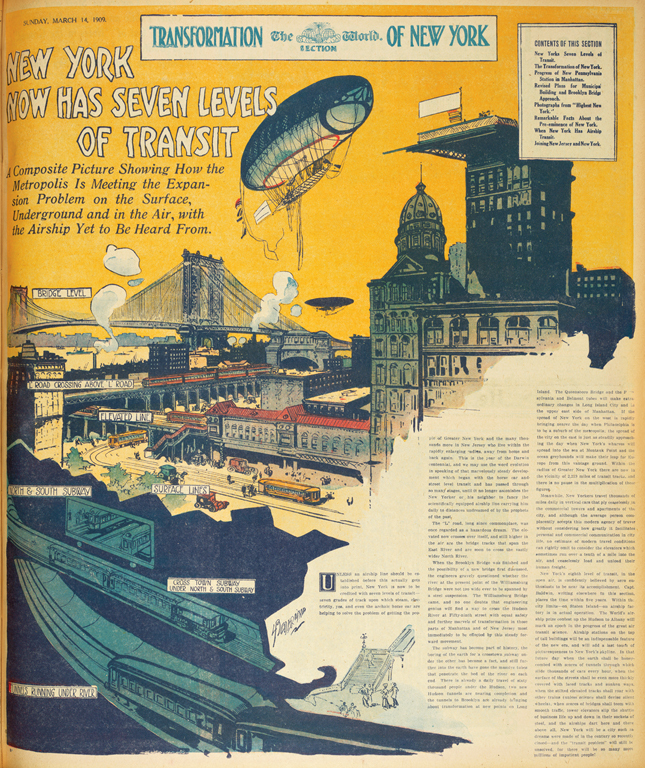 This page from the "Transformation of New York" section of the World depicts the artistry and details afforded by the new printing technology. The illustration by Louis Biedermann celebrates New York's growth and transportation in this lively city scene. By placing the golden-domed Pulitzer Building at the center of the illustration, Biedermann captures the World in the heart of a city of technological change and advance.